Tavush (Armenian: Տավուշ, [tɑˈvuʃ]), is a province of Armenia. It is located at the northeast of Armenia and bordered by Georgia from the north and Azerbaijan from the east. It is domestically bordered by the Gegharkunik Province from the south, Kotayk Province from the southwest and Lori Province from west. The capital and largest city of the province is the town of Ijevan. The name of the province is derived form the Tavush canton (also known as Tuchkatak) of the historic Utik province of Ancient Armenia. 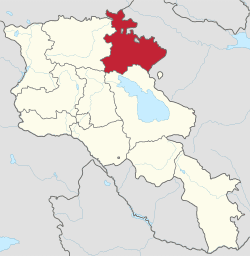 Tavush has an area of 2,704 km² (9% of total area of Armenia). It occupies the northeastern part of the Republic of Armenia. It is bordered by Georgia from the north and Azerbaijan from the east. Domestically, it is bordered by the Gegharkunik Province from the south, Kotayk Province from the southwest and Lori Province from west. The territory is mainly mountainous and rocky hillsides covered with a green carpet of Alpine meadows. Tavush is sometimes referred to as a little Armenian Switzerland. The average height of the region is around 900 meters above sea level. Based on the historical divisions of Ancient Armenia, the current territory of the province occupies parts of the Varazhnunik canton of Ayrarat province, the Dzorapor and Koghbapor cantons of Gugark province, and the Aghve and Tuchkatak (Tavush) cantons of Utik province. The province entirely lies among the mountains of the Lesser Caucasus. It is surrounded by the Miapor mountains from the east, the Somkheti mountains from the north, the Gugark mountains from the east and the Kenats mountains from the south. The highets point of Tavush is the Miapor peak with a height of 2993 meteres, while the lowest point is located at a height of 380 meters in the Debed river valley near the village of Debedavan. The province is a major source of water in Armenia. The main source is Aghstev river with its tributaries Getik, Voskepar and Sarnajur. Minor rivers include Akhum, Tavush and Khndzorut. Tavush is also rich for its mountain springs, mineral water and small lakes such as the Lake Parz and Lake Gosh. Most of the Tavush territory is covered with thick forests, mainly around the towns of Dilijan, Ijevan and Berd. The province has a number of protected forests including the Dilijan National Park, Akhnabad Taxus Grove Sanctuary, Arjatkhelni Hazel Sanctuary, Gandzakar Sanctuary, Ijevan Sanctuary and Zikatar Sanctuary. 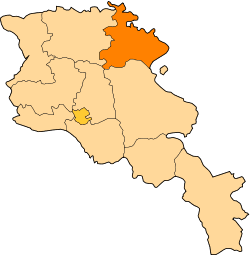 From 1930 until 1995, modern-day Tavush was divided into 3 raions within the Armenian SSR: Ijevan raion, Noyemberyan raion, and Shamshadin raion. With the territorial administration reform of 1995, the 3 raions were merged to form the Tavush Province. Tavush is the second least populated province in Armenia. According to the 2011 official census, Tavush has a population of 128,609 (62,083 men and 66,526 women), forming around 4.3% of the entire population of Armenia. The urban population is 54,186 (42.1%) and the rural is 74,423 (57.9%). The province has 5 urban and 55 rural communities. The largest urban community is the provincial center of Ijevan, with a population of 21,081. The other urban centres Dilijan, Berd, Noyemberyan and Ayrum. With a population of 4,420, the village of Koghb is the largest rural municipality of Tavush. The majority of the Tavush Province population are ethnic Armenians who belong to the Armenian Apostolic Church. The regulating body of the church is the Diocese of Tavush, headed by Archbishop Yeznik Petrosyan. The Surp Nerses Cathedral in Ijevan is the seat of the diocese. The town of Berd is home to around 200 Udis who also belong to the Armenian Church. A tiny community of Yazidis is found in Dilijan. Srvegh Monastery of the 13th century. "Tavush TV" based in Noyemberyan (since 2010). Tavush has a poor agricultural index with only 4.8% of share in the total annual agricultural product of Armenia. Around 41% (1,108 km²) of the total area of the province are arable lands, out of which 23% (256 km²) are ploughed. The population in many rural communities are mainly involved in farming, cattle-breeding and pig farming. The main crops are grains and grapes. Recently, bee-keeping farms were also opened in many communities. Tavush has the poorest industrial index among the Armenian provinces with a share of 0.8% in the annual total industrial product of Armenia. The existing industry is mainly dominated by food-processing and the production of alcoholic drinks. Ijevan is the economic centre of Tavush. During the Soviet period, the town had witnessed a remarkable industrial progress especially in the spheres of carpet manufacturing and wood processing. Many industrial plants of the Soviet days are still operating in Ijevan, including the "Ijevan Woodworking Enterprise" founded in 1936, the "Ijevan Wine-Brandy Factory" founded in 1951 (particularly famous for its pomegranate wine), the "Ijevan Mechanical Enterprise" founded in 1954, the "Jrashogh Ijevan Carpets" weaving mill founded in 1959, and the "Ijevan Bentonit Combine" for mining founded 1967. The Ijevan carpet weaving mill was the largest in the Caucasus and the 3rd-largest in the whole Soviet Union. The town is also famous for its handmade rugs and carpets. After the independence of Armenia, many small industrial plants were founded, including the "Karart" stone processing plant (since 2003). In 2014, the "Vector" company for software development was opened in Ijevan. Other major industrial plants in the province include the "Berdavan Wine Factory" in the village of Berdavan, the "Maga" food-processing fctory in Varagavan and the "Vital Echogarden" food-processing factory in Aygedzor, the "Tavush Textile" factory in Choratan, the "Bavagarm" meet-processing plant in Teghut, and the "Filishin" concrete manufacturing plant in Haghartsin. Dilijan is famous for its mineral water, being processed and bottled by the "Dilijan Mineral Water Plant" founded in 1947. The town is also home to the "Aramara" company for fine woodworking founded in 1993, and the "Dili" factory for dairy products founded in 2005. The small town of Ayrum is home to the "Ayrum Cannery" (since 1937), and the "Ayrum Fruits" food-processing factory (since 2014). Tourism and related services are still developing in Tavush. The cultural heritage and the natural monuments of the region attract a large number of tourists. The town of Dilijan is major touristic destination for locals and foreigners. It is also considered a financial centre as much of the Central Bank's operations was moved to Dilijan in 2013. The town is also famous with its sanatoriums and mineral water. Other touristic destinations include the villages of Achajur, Gosh, Teghut and Yenokavan. Many forests of the province are listed among the protected areas of Armenia, including the Dilijan National Park, the Akhnabad Taxus Grove Sanctuary, the Arjatkhelni Hazel Sanctuary, the Gandzakar Sanctuary, the Ijevan Sanctuary and the Zikatar Sanctuary. Lake Gosh, Lake Parz as well as the Ijevan Dendropark are major destinations for ecotourism lovers. Tavush has recently become a significant educational centre within the Republic of Armenia. In 2014, the United World College Dilijan, a part of the global educational movement United World Colleges, was opened in the Dilijan. Between 2013 and 2015, the construction of the Dilijan Central School -a branch of the Ayb Educational Foundation- was completed in Dilijan. In fall 2015, the newly built state-of-the-art school was officially opened. Since 1994, branches of the Yerevan State University operate in Ijevan. As of the 2015-16 educational year, Tavush has 81 schools. Football is popular in Tavush. The province was represented in the Armenian Premier League by Impulse FC of Dilijan and FC Bentonit Ijevan. However both clubs were forced to dissolve due to financial difficulties. Dilijan City Stadium and Arnar Stadium are the 2 largest sport venues of the province. Minor stadiums are also found in Noyemberyan and the village of Achajur. Arnar Stadium hosted the Armenian Independence Cup final match in 2008 where Ararat Yerevan won the title defeating Banants. As of February 2017, Tavush is home to the following 40 administrative communities (hamaynkner), of which 5 are urban, and 35 are rural. The administration of the province is headquartered in Ijevan.